The gripping and definitive chronicle of the iconic battle that inspired a nation--a sweeping saga of 200 brave Americans who stood tall against an overwhelmingly superior Mexican force. On February 23, 1836, a Mexican army thousands of soldiers strong attacked a group of roughly 200 Americans holed up in an abandoned mission just east of San Antonio, Texas. For nearly two weeks, the massive force lay siege to the makeshift fort, spraying its occupants with unremitting waves of musket and cannon fire. Then, on March 6th, at 5:30 am, the Mexican troops unleashed a final devastating assault: divided into four columns, they rushed into the Alamo and commenced a deadly hand-to-hand fight. The Americans, despite being hugely outnumbered, fought valiantly--for themselves and for a division of an independent Texas. In the end, they were all slaughtered. 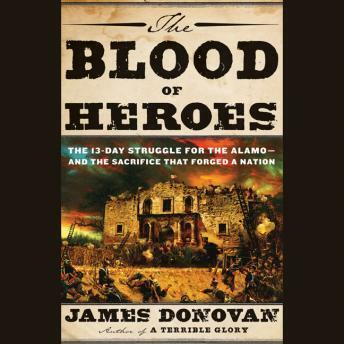 Drawing upon newly available primary sources, THE BLOOD OF HEROES is the definitive account of this epic battle. Populated by larger-than-life characters--including Davy Crockett, James Bowie, and William Barret Travis--it is a dynamic story of courage, sacrifice, and redemption.